Guguria is a much-loved local treat. Sometimes called “the Chamorro jawbreaker,” these small, hard sugar-coated cookies are made with just three ingredients: flour, sugar and coconut milk. 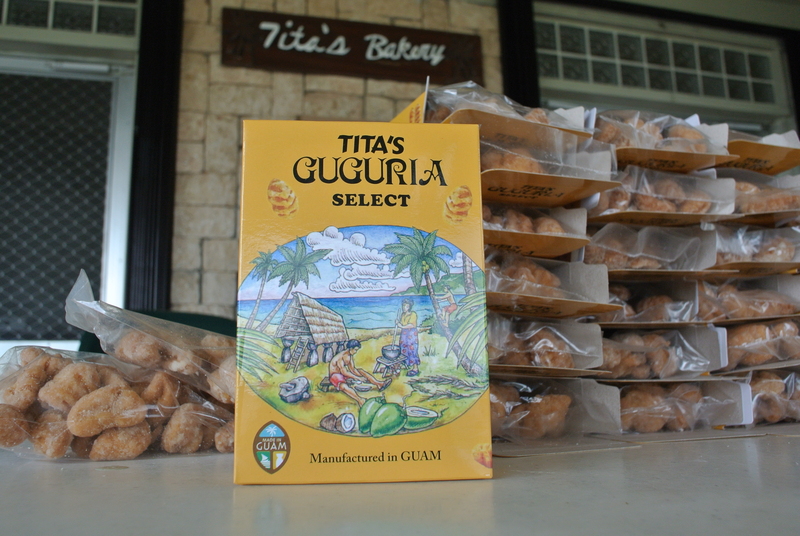 While most Chamorro families made guguria at home for personal consumption, Tita’s Bakery was the first to bring guguria into mass production and retail sales. Since those early days, the small family bakeshop, which began in a humble 12x14-foot room, has expanded in size and production, going from 10-15 lbs of flour daily to over 250 lbs daily. Today, Tita’s guguria is one of the most recognizable and best-selling products of Guam and is available island-wide, from small mom and pop and convenience stores to supermarkets and upscale shopping houses such as T-Galleria Guam. It is a popular gift item among both tourists and locals; locals are known to include guguria in care packages sent to family and friends in the states or in the military. Tita’s Bakery even filled an order for guguria requested by the White House shortly after President Bill Clinton’s visit to Guam in 1998. Over the years, Tita Leon Guerrero has been honored with many prestigious awards for the success of Tita’s Bakery. In 2015, Tita’s Bakery is celebrated its 50th Anniversary.